For those close to the region or planning to visit the Mosel at the end of September, here a quick heads up on the forthcoming annual presentation by the Klitzekleiner Ring. The Klitzekleiner Ring started as a small organization “at the fringe of the Middle Mosel” a decade ago. It has turned since into a nest of winemaking super-stars including Weingut Vollenweider, Weingut Weiser-Künstler, Weingut Martin Müllen and Weingut O., whose wines we have been regularly praising since almost a decade now and regularly make it as wines of the month. Should anyone be in the region or plan a visit, we warmly recommend to attend the annual presentation by the Klitzekleiner Ring, which is called Tafelrunde. It is always a very relaxed and cool affair. This year, the event will take place at in the gardens and cellars of the Villa Huesgen in Traben-Trarbach. More information can be found on the website of the Klitzekleiner Ring. Besides being able to taste the wines from some of the best Mosel producers, it is also an occasion to taste the wines from the Bergrettung project, in which the members of the Klitzekleiner Ring take in turns to rescue an old steep-sloped vineyard at risk of being abandoned (more information in this article on the 2008 Bergrettung Spätlese which we highlighted as wine of the month a few years ago). In addition, there is also Villa Huesgen as guest Estate, some of whose wines we rated quite positively in the Mosel Fine Wines Issue No 28 (Jun 2015). 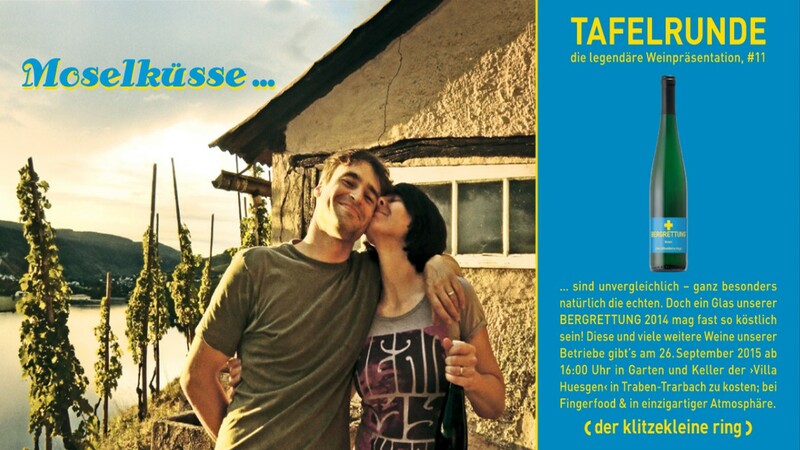 PS: We cannot vouch for the fact that dashing Konstantin Weiser or Alexandra Künstler from the Weingut Weiser-Künstler will greet everyone with a Mosel kiss.